To find a sad, useless, and miserable existence, one need look no further than the life of St. Germaine Cousin. She had a deformed and partially paralyzed hand and wretched health. She lacked any education, and had only a spinning wheel to spin wool and a crook to lead her sheep. She died at age 22. This is all that the world saw in St. Germaine Cousin. 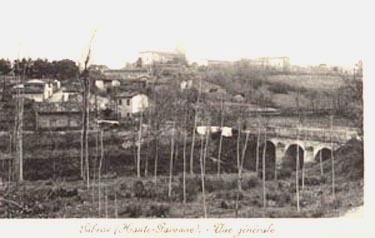 Germaine was from the village of Pibrac near Toulouse, France (1579-1601). She was born with a paralyzed right hand and afflicted with scrofula. Germaine passed her life under the authority of a stepmother, who detested her, beat her, mistreated her, and kept her apart from her brothers and sisters. Her father, Laurent Cousin, had no special affection for his daughter and ignored her sufferings. Since she was not considered good enough to stay in the house with the family, he gave her a small five-foot spot under the stairway of the barn as a place to sleep. Her bed was leaves and twigs on the floor, and her food only black bread and water. She was in charge of watching the family’s flock during the day. She was also given an allotment of wool to spin while the sheep were grazing. If she did not meet the expected quota, she was severely punished. 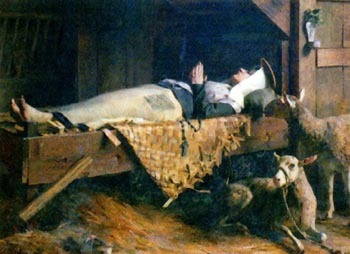 As a shepherdess, Germaine spent much time praying. Often the villagers laughed at her devotions, and mocked her for her misery. Her only answer was silence. She took a great care to never lose her pleasant composure in face of her sufferings and misery. She never asked God to free her from that difficult situation, even when she knew that He would listen to her prayers. In fact, God worked many miracles through her to show His pleasure with her. During her working day, she always went to Mass. When she heard the bells ringing, she would set her crook in the ground and run to the church, leaving the care of her flock to the Divine Shepherd. Her trust was never betrayed: not one of her sheep was ever lost or caused any damage to the neighbors’ lands. Further her flock was the healthiest and best looking in the area. One day, after a strong rain the creek had become a raging stream, making it impossible for her to reach the church. Two peasants of the region who knew her custom to attend daily Mass came to laugh at her predicament. Instead of mocking her however, they saw the poor shepherdess walk straight toward the river without any hesitation. As she set her foot in the raging stream, the waters separated, allowing her to cross, just as the waters of the Jordan had opened for the Ark of the Covenant to pass. After she reached the other side, the waters returned to their tumultuous course. The peasants watched this with awe and fear, and then reported the miracle to the whole village. Germaine also multiplied loaves of bread, as Our Lord did. One winter day, she put some small pieces of bread in her apron to give to the poor. Accusing her of theft, her stepmother stopped her and threatened to beat her with a rod. In a great fury, she approached the girl, hurling every insult at her. Two inhabitants of Pibrac saw what was happening and went to protect the girl against the stepmother’s fury. They saw her stepmother order Germaine to open her apron, and instead of pieces of bread, a magnificent bouquet of beautiful and flagrant flowers tumbled out. No garden in Pibrac had every produced such flowers, and this was in the dead of winter. 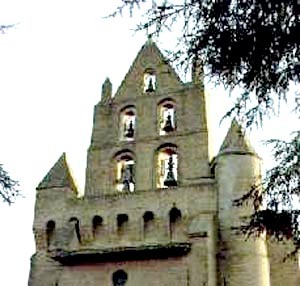 One night, two traveling monks decided to take refuge for the night in a forest near Pibrac. They were sleeping when they were suddenly awakened by the sound of a marvelous singing. They looked and saw a group of virgins amidst a splendorous light who were passing through the forest toward Pibrac. The vision disappeared, but after a while the group appeared again. This time the cortege of virgins was coming from Pibrac, but one more virgin had joined the group. It was Germaine, wearing on her forehead a crown of fresh flowers. The monks were charmed by this heavenly vision and spread news of it everywhere. 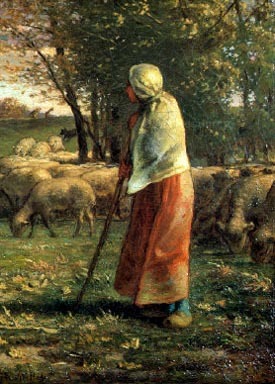 The following morning, Germaine did not appear to take charge of the sheep. Her father went to seek her in the cubicle, and found her dead on her simple pallet under the stairs. She had fallen into her final earthly sleep. Today the relics of St. Germaine of Cousin are venerated in the Chapel of St. Francis de Sales in Pibrac. More than 400 miracles were credited to her intercession in the processes of canonization. 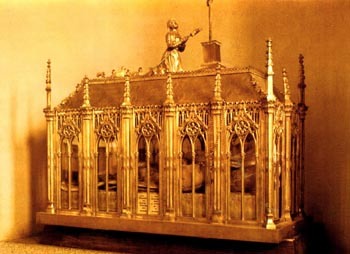 The site with her relics became the object of frequent pilgrimage, and the deliverance of two Popes from their captivities – Pius VII and Pius IX – are attributed to her intercession. What is the great lesson from the life of St. Germaine Cousin? As you saw, she was born at the end of the 16th century. There was a stark contrast between her life and the spirit of the century in which she lived. That century was deeply marked by the errors of the Renaissance that dictated men should be completely turned to the pleasures of life and earthly glory. Certainly its quest for glory was less vile than the frenetic lust for money that we witness today. Still, it was a very censurable aim because it was turned only toward self-love. Real glory, which is celestial glory, was despised. It was a century that made vainglory one of its idols. In that century a Saint was born who became venerable because she represented the opposite of that vainglory. Her life was filled with all kinds of humiliations. She had a very bad health; she was handicapped; she was treated cruelly by her own family. Presumably she did not know how to read, lacked any education, and had no special intelligence. She had everything that would make her despicable in the eyes of the world. It so pleased Divine Providence to amass in St. Germaine every cause for humiliation that one can imagine. This is one aspect of her life. Another aspect is that God worked the most extraordinary miracles on her behalf to show how He was pleased with her sanctity. One of the miracles was to open the waters for her to pass, just as the waters of the Red Sea separated to save the Chosen People and the Jordan separated to make a path for the Ark of the Covenant. Another miracle was to transform bits of bread into flowers, just as He did for St. Elizabeth of Hungary. Yet another, for which the selection gives no details, was the multiplication of loaves as it occurred with Our Lord. That is, these were first class miracles which could give her reason to be proud. But she did not become proud; she was perfectly humble, even after the fame of the miracles spread throughout the area. It is sad to see her family’s cruelty toward her. Since the family lacked mercy, its members were chastised and became blind with regard to her sanctity. They did not see her extraordinary qualities. Certainly they knew of her fame for working miracles, but they were indifferent and continued to persecute her. Their hardness of heart was plainly evident in the episode of her stepmother threatening her with the rod. St. Germaine’s extraordinary composure is shown in the patience with which she bore her situation. If she had prayed and asked God to cure her and free her from those humiliations, He most probably would have granted her request. But she did not do this. She also could have confronted the family and said: “You are fools for treating me like this, because if you need a miracle from God tomorrow, I may not ask it for you.” But she did not say anything of the sort. Her humility was perfect and twofold: First, because she accepted the humiliations that Divine Providence had sent to her, and second, because she refused to attribute to herself the inebriating perfume of the miracles that she was working. Nor did she become proud because of the fame they earned her. In this attitude, you see the exact opposite of the mentality of her century. In that century of vainglory, God sent a Saint who practiced an extreme degree of humility and flew in face of worldly models. She did not heed those models and, for that reason, she was glorified by God. God allowed her fame to spread in large circles around her. One can imagine the news of the miracles she worked reaching the palaces, the convents and monasteries, the milieus of the high bourgeoisie, inviting everyone to admire her and say a prayer through her intercession. This was the message for the world: “The prayer of those who do not have vainglory is heard by God,” which translates into this: “If you want to please God, abandon vainglory.” It was, therefore, a profoundly counter-revolutionary message. It was an exhortation to humility contrary to the pride of the Revolution; it was an exaltation of virginity in opposition to the sensuality of the revolutionary world. Later, her fame spread so far that even two Popes – Pius VII and Pius IX – asked her intercession to be freed of their captivities. That is, the poor shepherdess became the protectress of the most glorious institutions that exist, the Holy See and the Papacy. This shows to what great heights God brought her. What is the special lesson for us in this life? It is this: we should practice the same kind of virtue that St. Germaine did. The counter-revolutionary soul is, from a certain point of view, a combatant for the highest cause; but in another respect, he is a kind of Saint Germaine Cousin of our century. He is mocked, isolated, the recipient of unjustifiable bad treatment and considered outlandish by the world. He is not despised per se, but he is hated for the cause that he represents. We who are counter-revolutionaries should learn from St. Germaine how to endure this hatred just as she endured her humiliation. We should humbly receive personal injuries and patiently accept them for the glory of God, like meek lambs. Every affront that is personal – touching our self-love, self-interest, personal needs – should not raise our indignation. We should be silent regarding these points just as she was silent in face of the offenses she suffered. On the other hand, if someone should offend God and the Catholic Church, we should raise up like lions in Their defense. She would have done the same if circumstances had demanded it. At the end of her life, you heard about the marvelous miracle of the apparition of a choir of virgins to two traveling monks. Nothing is more beautiful and poetic than the woods of France, which are very hospitable to men: no swamps, no flies or mosquitoes, and no snakes. They are woods made for man to rest. You can imagine the beautiful scene of two monks in their habits and sandals, with their beards and staffs, making a long trip by foot, recollected and praying. Night came upon them and they decided to sleep in the forest, tranquil in the peace of God, waiting for the coming dawn. They lay down on the bare ground innocently sleeping with their rosaries in their hands. Suddenly the pair were awakened by a supernatural phenomenon. They saw a group of virgins walking in the woods, unencumbered by any material obstacles in their way. The leaves below their feet did not bend from their weight; they passed through the trees as if they were nonexistent; their voices filled the forest with a beautiful and heavenly song. The monks fell to their knees, and watched everything with rapt attention. The choir of virgins passed; then, a short time later, it returned with increased joy because they had been joined by another virgin. Their new companion no longer had a paralyzed hand; her skin was pure, free from scrofula; her humiliations had ended. She passed in glory with a crown of flowers on her forehead. Just as in a fairy tale, the shepherd girl had become a queen. She was surrounded by her ladies of honor and walked like a princess, stately, noble, and joyful. She was on her way to Heaven to receive her glorification. It is a wonderful ending. It was a kind of canonization in life that God wanted to give her, indicating to the world that He deposuit potentes de sede et exaltavit humiles – He put down the mighty from their seat and exalted the humble. He wanted to show that exemplary humility is crowned with glory in Heaven.